On September 6th, 2015, Beka Davis and Tracy Steele exchanged marriage vows in a Shambhala Wedding Ceremony. 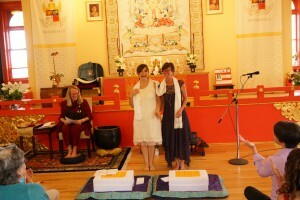 Acharya Judith Simmer Brown led the joyful ceremony in Boulder, Colorado at the Boulder Shambhala Center. 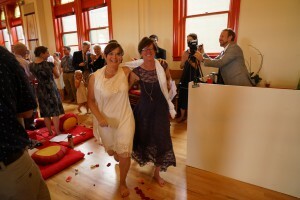 The vows were witnessed by family and friends from near and far and the Shambhala sangha. 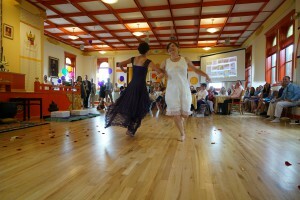 There was much rejoicing with laughter, tears, poetry, singing and dancing to mark the significance of this day. Beka and Tracy extend deep appreciation to the Boulder Shambhala sangha for holding and supporting their wedding. 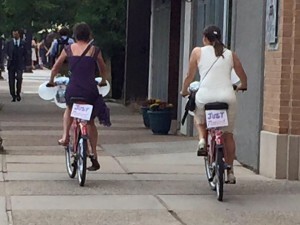 They were last seen riding off on bicycles! Congratulations, Tracy and Beka! I love the bicycles!